I just finished up my first year as a coach of my son’s four to six year old T-ball team. I’ve never coached anything, but hoped everything was going to turn out alright. Sure, I have handled my fair share of four year olds thanks to my job, but generally speaking, they have not had bats in their hands or were throwing semi-hard baseballs at each other. It was a blast and no one got hurt! Success. 1. Always keep your hand on (or close to) the bat. I appreciated this lesson that came up in the coach’s meeting when an experienced coach said, “don’t let go of the bat until you are all clear and ready for that kid to swing.” What a great lesson. I was always especially careful of where the bat was at all times. And he was right…once you let go, that kid is gonna swing away. As for parenting, I think this speaks right to the heart of always being prepared and super focused when the situation is potentially dangerous (physically, emotionally or behaviorally). Keeping an eye out, surveying the field and then letting go of the child when it is safe for them to swing away ensures success or extremely reduces the chances of failure. 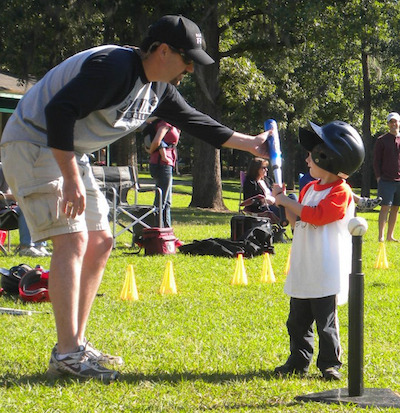 In those situations…hold onto the bat until you are sure everything is ready. 2. Never forget to show them where first base is. I could not believe it. The last game of the season and I still had a few players run in the wrong direction or not run at all when they hit the ball. I assumed too much. I assumed since we had practiced running the bases and had been playing for so long they would have it. Nope. Not all of them (including my son who I had to stop from chasing down the ball he had just hit and redirect him to first base). There are times when, as parents, you will assume incorrectly that your child knows what behaviors are expected. “He should know by now” situations will come up and potentially be tough to manage. Until you are completely sure your child knows what do to and what behaviors you are looking for, remind them. Show them. 3. The team will tell you when you are not in control. Yes, there were times when things were more hectic than I had planned. The players got a little pushy in line, started talking more about “being first” or “thats my ball.” This always, without exception, occurred when I did not have as good of a grasp on the current situation as I had planned. Too many kids in the line waiting to catch, too much time between batters, too few helmets, lost gloves, etc. Their behavior was a reflection on how well I had prepared them and the activity. In the same way, your kids will tell you (with their behavior) when you are less in control: when you had too little sleep, too much aggravation, not enough time to finish that first cup of coffee in the morning. Remember, your kid’s behavior is often a reflection of your preparation and organization. Dont take it out on them. Wake up earlier, sleep more, take a “chill out” if frustrated, etc. 4. Find a white line. 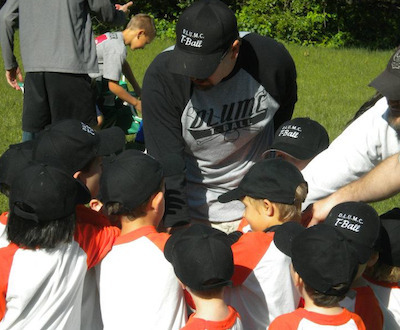 When we were out on the field, I was always looking for some physical something to help the kids know where they needed to be. The white line became my source of boundaries. The circle around the home plate area was where they needed to be while we were hitting, the line from third to home was where their feet needed to be during fielding drills, the line from home to first base was where they needed to walk to shake hands with the opposing team after the game. Boundaries with children are important to maintain as are very clear expectations. Sometimes we have to make it exceptionally clear and give physical references for the behaviors we want. I mentioned the Parking Pal on the Facebook page previously, which is a perfect example for this. Find those physical boundaries and things in the environment to make sure your expectations are clear and visible. This is probably one of the practices most influenced by my work. I know sometimes kids have difficulties transitioning from one thing to another. Especially when they are in a group of 13 all getting ready to bat, things can go haywire if you do not watch out. So, every time we had any transition at all, we “huddled up.” Everyone together, hands in the middle, I would give the instructions of what we were going to do next, then finish it off with a “1,2,3 – GO ORIOLES!” That part was necessary because it made them want to come to the huddle. Otherwise, I would have struggled to get them in a group and maintain them at such close quarters. Also, it allowed me to have control and everyone’s attention at a time of transition. I was able to assign batting order, get them behind the line and do so in an orderly manner because I had then all right there with me. This is so important in the daily lives of parents. There are changes in the schedule, some going more announced than others, and some when you are going into something that might not be as fun as the last thing you just did. Huddle up, inform your kids of what is coming up. Be prepared yourself so you can prepare them. Bring them together so you can start from a good, organized position rather than going into your next activity without fully gaining control of them. This is huge. Oh, and as always, make it fun and cheer for them. A good high five goes a long way! This entry was posted in Uncategorized and tagged boundaries, out of control, prevention, teaching by BehaviorBandAid. Bookmark the permalink.